We at OneDesk recognize that customer satisfaction plays an important role in a business’ growth. Therefore, we are proud to introduce our new customer service, help desk, and case management applications. Support cases can be difficult to manage, especially if they are numerous. One of the challenges that support teams face is that they often need to sort through many support emails to find what they are looking for. 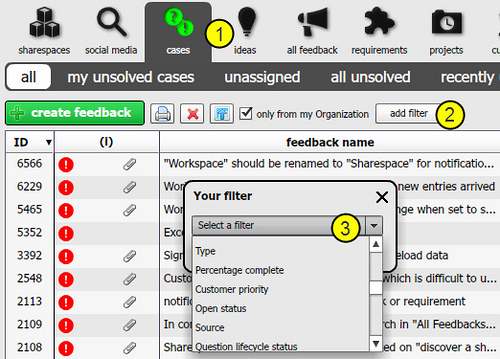 OneDesk allows you to filter and sort your support cases using a flexible and extensive set of stacked filters. This allows you to search your support cases and pull up the ones that are important to you. Search based on many criteria such as name, description, lifecycle status, creation date, last response date, percentage complete, customer priority, number of votes, and more. (1) Go to the cases tab. (6) Keep adding as many filters as you wish. For example, you can search for all cases created before a certain date, with a customer priority of over 3 stars. The filtered search results will be updated with any new feedback matching the search criteria. We want to know: How do you solve your case management challenges?